The Malware Protection Test is an enhancement of the File Detection Test which was performed in previous years. Due to the increased scope of the test, readers are advised to read the methodology described below. Please note that we do not recommend purchasing a product purely on the basis of one individual test or even one type of test. Rather, we would suggest that readers consult also our other recent test reports, and consider factors such as price, ease of use, compatibility and support. Installing a free trial version allows a program to be tested in everyday use before purchase. In principle, home-user Internet security suites were used for this test. However, some vendors asked to test their (free) antivirus, or business security product. The CrowdStrike, eScan, Fortinet and Seqrite programs tested here are business security products. Information about additional third-party engines/signatures used inside the products: Adaware, BullGuard, Emsisoft, eScan, F-Secure, Seqrite, Tencent (English version) and VIPRE use the Bitdefender engine. AVG is a rebranded version of Avast. All products were installed on a fully up-to-date 64-Bit Microsoft Windows 10 Professional RS2 system. Products were tested at the beginning of September with default settings and using their latest updates. The test set used for this test consisted of 20,011 malware samples, assembled after consulting telemetry data with the aim of including recent, prevalent samples that are endangering users in the field. Malware variants were clustered, in order to build a more representative test-set (i.e. to avoid over-representation of the very same malware in the set). The sample collection process was stopped on the 24th August 2017. 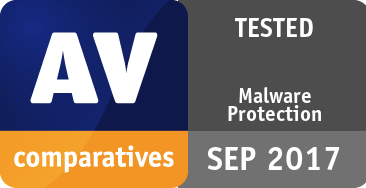 All the products participating in this test achieved high scores (over 99%) relative to simple file-detection tests. There are two reasons for this. Firstly, a representative set of prevalent malware samples is used. Secondly, in addition to on-demand detection, the test includes on-access detection and on-execution protection. Due to the very high overall standard thus reached, the minimum scores needed for the different award levels is also very high compared to other tests. The test-set used contained 20011 recent/prevalent samples from last few weeks/months.